Well today was one of those crazy days. I think this is the first time that I have sat down all day – no I lie I sat for about 10 minutes while I ate dinner with Molly on my lap so I’m not sure if that really counts. We were up early as usual I managed to wash my hair and get ready before Dave left for work. Clean up breaky dishes and put on a load of washing while eating my breakfast and having a cuppa. Dress girls, make beds and tidy up while making my morning calls to my mum and my sister. Help Oscar with his homework. Girls are watching ABC Kids. Cut up fruit and take out a snack for kids morning tea. Fold and put away yesterdays washing. Check and answer a few emails and get interrupted by kids. To keep them occupied for 5 mins I print of some Olympic colouring-in craft activities from the internet and we decide to make some Olympic cookies. I put Molly down for a sleep and begin to make the cookie dough. Place it in fridge for half an hour. Clean up, empty dishwasher and put on another load of washing. Call my girlfriend. Roll out and bake cookies. Layla and I have a play on the Cricut as I’m making some birthday tags for my Kindy Kids. Oscar is on the Computer. OK I think you get the idea and yes it’s not even 12 o’clock! So here I am sitting in front of my laptop thinking what a busy day I’ve had but then again it’s no different to any other day. PS made your zucchini slice last week – delicious. If I could I would send it your way! glad you enjoyed the slice. HaHaHa, that’s how I feel on a regular basis. Sometimes I think I am ten times busier when I home on the weekends as opposed to during the week when I am working. I am not sure but I do know its rare that I get a moment to myself! 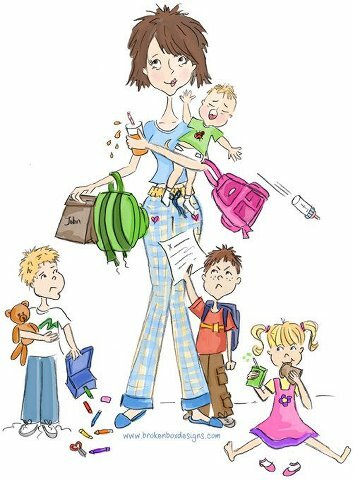 These are the joys of motherhood though! !